I’ve been meaning for a while to write about my experiences as an ultra endurance athlete regarding the peculiar interaction of physical stress and Type 1 diabetes. Usually you’d expect to be insulin-sensitive after a long endurance workout, right? But the physical stress of ultra running is weird. It has a completely different, polar opposite effect — even though you’re still doing endurance exercise. You literally can start off relatively insulin “neutral”, be insulin-sensitive 3 or 4 hours in, and insulin-resistant 17 hours in. It’s just part of the package of Type 1 diabetes and ultra endurance. I’m not a doctor or healthcare professional, so my explanations are simplified and undoubtedly blow right past important scientific details, and I’m certainly not qualified to give anyone medical advice. That said, here’s how it all appears to work for me, including quite a few surprises. As always, YDMV — Your Diabetes May Vary. NOTE: For my friends in Canada, the UK, and elsewhere, divide the mg/dl numbers by 18 to get mmol. Up to a point, the more you exercise — in my case, running — the more insulin sensitive you become. Any Type 1 diabetic who’s ever run a marathon and then dealt with scary lows overnight knows what I’m talking about. I’m not a healthcare person or scientist, so my simplified understanding goes like this: while you’re running, your body catches on to the idea that the food you take on is going to get burned right away. More of it than usual provides the energy the body needs right now to continue being active. The rest of it goes to replenishing spent energy resources. When you get your normal amount of insulin, only a portion of the glucose you get from food is actually immediately available to you. And that means low BGs… unless you drop your insulin. That may mean dropping your meal bolus — or dropping your basal. Also, the more you train, the more efficient you get at using the carbohydrates you have. That means you may need less fuel to go the same distance. You may find that you can run your basal rate a little bit higher, or that you can run longer with your reduced basal rate than you could before. If you’re doing ultra endurance exercise, the most informative think you can do during training is: test Test TEST. Especially if you’re pushing your limits or are new to a particular sport, since your body will most likely be MORE insulin sensitive during and after exercise. You don’t want race day to be a surprise, at least not in a bad way. Glycogen is basically glucose that’s stored in the muscles and in the liver. Your muscles normally contain around 350 – 500 grams of glycogen. The liver usually has about 100 grams of glycogen. To put that in perspective, something like a Honey Stinger gel packet has about 30 grams of glucose. Muscle glycogen lasts about 90 minutes for most people during a run or other endurance activity. After long workouts or events, like a marathon, ultramarathon, or 70.3 or 140.6 triathlon, your muscle glycogen is long gone. In this scenario, much of the food you eat after exercise is almost immediately dedicated to replenishing muscle glycogen and the much smaller store of glycogen in the liver — your “backup tank”. The more you train at longer distances, the more your body may tap long-term, harder-to-break-down energy stores like body fat and protein found in muscle. Call yourself fat-adapted, call yourself a human camel… I don’t care. The point is, switching to whatever energy source is available is just normal for human beings. Though a lot of people like to argue about the right way to do it, we do it whether we try to or not. Think of it from an evolutionary perspective as having escaped the cheetah and now migrating to safer grazing grounds. We get more efficient at getting energy from anywhere we can find it. If you’re a dedicated Type 1 athlete who does really long distances, you may discover that this flexibility actually allows you do better with a mix of carbs, fat, and protein — instead of relying mainly on fast carbs like gels. A lot of my ultra running and cycling buddies swear, for instance, by Payday bars. After all — despite being junk food or as I like to say, “high-energy non-natural fuel alternatives” — they’re a good source of fat, salt, sugar, and protein. The problem is that there usually comes a point where you’re burning through fuel faster than you can replenish it. Food that takes too long to break down — for instance, fat, protein, or resistant starches like uncooked corn flour, cold potatoes, UCAN, maltodextrin, complex carbs, etc. — may not come on board fast enough to keep you from going low. This is why you have to test, test, test, AND experiment with different foods during training. What works great for 26.2 miles probably isn’t the right answer for a 50- or 100-mile ultra, or a double-century bike rally. For example, I’ve learned that on my 60-mile training runs, I have to bump up all my calories, AND increase my fast carbs, starting around 4 pm. Otherwise, by around 6 p.m., I just can’t get my BG to stay above 70 – 80 mg/dl. There’s a limit to simply switching fuel sources. You start using your own body, first fat and then muscle as a fuel source. That’s fine for a while. But you’re probably burning 500 calories/hour, for 15 – 24 hours/day, depending on the event. So 7500 – 12000 calories total. A pound of fat hypothetically provides 3500 calories. Covering your calorie requirements with only body fat would burn through something like 2 – 4 pounds of fat/day. Yes, during ultra endurance sports you replenish SOME of that when eating, but usually not nearly enough. Very few runners can actually keep down 7500 calories a day during an event. They try. A lot of them wolf down baked potatoes, pudding, ice cream, pizza, burgers, lasagna, and high-carb, high-fat, high-calorie nutritional drinks like Ensure. And they still don’t take in 7500 calories a day. For super-long endurance — multiple days, weeks or months — that can be an even bigger problem. At that point, you have two choices: continue “eating” your own body (which has its own unpleasant side effects, including muscle breakdown), or slow down. I slow down. Most ultra endurance athletes I know choose to slow down. I’ll talk about that in a moment. Sure, if you over-fuel your sugars will run high after a long workout. But what I’ve seen is that most Type 1 diabetic athletics routinely experience high post-workout blood sugars no matter how we fuel. In fact, it often happens even if we don’t fuel, or stop fueling well before the end of our workout or event. Post-workout highs that clearly aren’t fuel-related are typically caused by “liver dumping”. This is a biochemical response to intense or very prolonged exercise that happens in everyone, whether or not they’re diabetic. For Type 1’s, liver dumping usually looks like a sudden, huge blood sugar spike, as much as 200 – 300 mg/dls or so, on top of your normal BG. How fast is “sudden”? Within an hour, for example. And to be perfectly clear: I’m not saying your sugar will be 200 after liver dumping. I’m saying, if your sugar was 200, after liver dumping, it can jump to 400. Think of this way: intense exercise places an incredibly high physical demand on your body. In response, the body tries to send all available “troops” to the front line to fuel that demand. How does it do this? It releases adrenaline, dopamine, and other catecholamines that tell your liver to release available glycogen immediately. This process has nothing to do with diabetes. And Type 1 does not enhance OR inhibit this response in any way. For once, we’re just like everyone else. Now, in NON-diabetic people, once they stop exercising, the body releases more insulin to counteract this effect and restore normal blood sugar levels. And of course, you still need that recovery meal even though your sugar’s elevated — which just complicates things further. More on that in a minute. There aren’t any evidence-based guidelines for how much insulin you should get post-workout — each of us has to figure out our individual answer, by testing, dosing, testing, dosing. The usual drill. For me, it’s usually 1 – 1.5 units, even if I stop fueling 30 – 45 minutes before the end of a long run. But that’s just me. Do not assume your experience will be the same. Start with a very small post-exercise bolus, test, test, test, and you’ll figure out fairly quickly what works best for you. If you’ve liver-dumped during a workout, your “backup tank” is going to be low on glycogen for a while. First, because you tapped into your energy reserves. Second, because they have to be replenished using the food you eat. When you sleep, your body is going to start using pretty much all of your available energy — i.e., glucose — to repair cell damage and replenish stored energy. Whatever insulin you have on board is going first to allowing your body to replenish spent glycogen reserves. More energy will be stored, and less will be available to fuel even simple physical activity like walking around. Your blood sugar may be persistently lower than you expect. That’s why people mean by insulin sensitivity. since you’ve depleted your liver glycogen stores, a glucagon emergency kit may not work, or may not work as well. After all, glucagon’s role is to get your liver to release stored glycogen. If you don’t have any to release, that could turn into a medical emergency pretty fast. If you’re recently diagnosed, overnight lows can be even more unpredictable and thus more dangerous. About 60% of newly-diagnosed Type 1 diabetics are still naturally producing a little insulin as much as 10 years out from diagnosis. And they’re still naturally producing some level of glucagon. Eventually, you stop producing both hormones. But as long as your body is still trying to drive with a failing automatic transmission — and you’re switching over to driving with a manual transmission consisting of shots, testing, etc. — there’s always more unpredictability. This is why you should take post-race recovery meals — and eating regularly during much longer events — very seriously. These meals replenish liver and muscle glycogen. After a race, recovery meals should ideally be within an hour of your finish. Studies have shown that this is when your body will most efficiently replenish glycogen stores. Miss this window, and it can take a couple of days to replace glycogen stores in the liver. 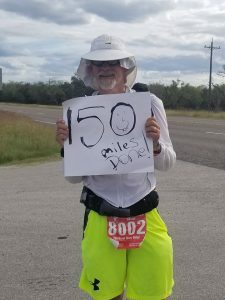 During a super long event such as 100-miler or solo Ragnar-style relay run, you can do the same thing by breaking your run down into marathon-sized chunks and taking on a larger meal every 25-26 miles or so, or at “natural” mealtimes such as lunch and dinner. Our bodies are used to that anyway. My wife and I always, always set an alarm clock to wake me up to test around 2:00 AM after a heavy-duty workout or big event. I’ve learned that I’ll nearly always go low around 3, sometimes pretty hard, and I want to get some sugar on board before that happens. I’ll usually test the second night as well, especially if I’ve been running low during the day or two since the event or I know I haven’t eaten that much since the event ended. After a 4-day 200+ mile solo run where I pushed really hard and only got about 9 hours of sleep total, my sugars ran high for weeks. I set a lot of overnight alarms. Why? Well, I was getting much more insulin than I usually do to treat the high BGs. And since my sugars weren’t behaving as they usually do, I figured the whole situation was less predictable and thus higher-risk until everything settled back down. I’ll talk about the whole running-high-during-and-days-after-big-runs part next. During prolonged stress, your body may also secrete stress hormones. The best known stress hormone is cortisol. Stress hormones are basically your body’s natural steroids. If you’ve ever had to take prednisone, you know what steroids do: they raise blood sugar. Often, a lot — as much as 150 mg/dl, for example. The increase in blood sugar caused by stress hormones serves a purpose. It gives us the energy to escape or endure what’s going on now. The flip side of this is that once we’re past some of that stress, we need to refuel, or we’re pretty much dead in the water. We’re the gazelle who fled the cheetah, running until he dropped, only to be caught by the patient cheetah in the end. Not surprisingly, stress hormones’ effect of making us feel sleepy and gain weight also serve beneficial purposes: to replenish those emergency energy reserves. That “bump” of blood sugar can be used to “push through” to the next gas station, the next guardrail, or the next shade tree… but at a price. Using a stress-elevated blood sugar like it’s free fuel creates more stress, which raises stress hormones, which raises blood sugar again. And again, until your body exhausts its resources, starts consuming itself — including muscle — and begins breaking down. This is why, as attractive as not eating may sound to a runner with an upset stomach, letting your body “tap out” your energy reserves is a bad idea. There are serious immunological consequences we’ll talk about in the next section. Just dosing your blood sugar down with insulin re-stores the dumped energy, which just gets dumped again, because after all — you’re under a lot of stress. I first noticed this at my first 100-mile race, when my blood sugars followed a “scalloped” pattern of rising and falling using nothing but insulin. Eventually I had to eat, and that was when my sugar finally dropped. Finally, you may experience new immune reactions. The current thinking is that intense exercise has several physiological effects that further annoy our immune systems. For example, research on ultra runners has found that gut permeability is increased during extreme events. That allows bacteria which are normally are isolated in the gut to begin to move into the rest of the body. That can provoke an immune response. Similarly, as muscle breakdown occurs, the immune system may react to these proteins as foreign matter and fire up an immune response. The right doctor to see in these situations is an allergist/immunologist, and in particular, one who understands how stress affects the immune response. Most ERs and urgent care clinics will automatically prescribe prednisone for hives. However, that spikes Type 1 BG’s as soon as you take it. Even after you STOP taking it, the high BG pattern will continue for 2 – 3 more weeks. A little background story: much to my surprise, in 2016 I was the top male finisher at a quadruple marathon. Now I’m not generally fast — in fact, I never age-group, but I got caught up talking to a running buddy who I didn’t know was in first place, so you can imagine how fast I was going! About a day and half after the event, I noticed an itchy spot at my waist during lunch. By mid-afternoon I was going crazy, with hives breaking out pretty much everywhere from my knees to my shoulders. I didn’t know better, so I went to my urgent care. They injected prednisone AND prescribed oral prednisone on top of that. Not only did it not help the hives, my BGs were through the roof. A day later I thought of calling my allergist who said they were the worst hives he had ever seen. He immediately prescribed a strong antihistamine, hydroxyzine, as the first-line treatment for severe hives, plus scripts for Cingulair and montelukast as second- and third-line treatments if needed. The hydroxyzine did the trick, but it still took close to 3 weeks for the BG effects of the prednisone to wear off. He also advised me to double up on the antihistamine Allegra/fexofenadine beginning about a week before my next big ultra. That’s exactly what I did, and no hives. When the immune system is stressed, it triggers inflammation. Inflammation is normally a good thing — it’s our body’s attempt to kill off the bad guys. For Type 1s, our bodies are in constant freak-out mode. A lot of us are allergic to dozens if not hundreds of substances.About 40% of us have at least 1 – 2 other autoimmune diseases in addition to Type 1 diabetes, most commonly thyroid-related or celiac disease. Every little itch seems to throw our immune systems into DEFCON-4. Who knows what they’d do if they actually went full psycho on you. For a lot of us, our cholesterol numbers may run high — after all, they’re a proxy for inflammation; and likely one of the reasons that certain statins such as Crestor, which appear to exhibit anti-inflammatory mechanisms of action, appear to reduce cardiovascular risk specifically in Type 1’s. If your body is under stress from excess weight, a horrible work environment, etc., exercise can reduce stress and inflammation. But exercise can also aggravate inflammation, especially if you’re pushing distance, duration, or intensity. That doesn’t mean you should stop doing it… but it does mean you need to take stress into account. I know quite a few people who like to take “preventive” NSAIDs like Advil and ibuprofen before big training workouts or events. Or they start popping them the day of the event. Or after the workout or event to deal with DOMS and other aches and pains. I think this is flat-out a bad idea. First, NSAIDs actually have their own serious health risks, especially in higher dosages. Second, they don’t address the root cause of the pain. Strong association with kidney damage in a good-sized study of ultra marathoners at the Western States 100-miler. Most folks got better, but some had to be hospitalized and took up to a year to recover. Strong association between certain NSAIDs and higher cardiovascular risk when taken long-term. Less risky alternatives include OTC or prescription topical NSAID creams used in very small amounts, only when needed. These typically don’t cause gastrointestinal problems and don’t seem to be associated with kidney issues. The strongest OTC NSAID cream that I know of in the U.S. is BenGay Ultra and its house-brand equivalents. It has a 30% concentration of methyl salicylate, an anti-inflammatory. I tried this first, in fact, and it does a decent job. Sometimes I rotate it with the diclofenac cream. Most of these you can use on a super-long run, but if you can’t go on without a lot of it, it’s much better to think about slowing down or bailing on a specific race than it is to try to pop a few pills and muscle through it. New races cost only a few hundred dollars. New kidneys… much more expensive, IF you can get one. One of the laws of the T1D universe is that when your sugar’s high, you need insulin. Not food. Sound familiar? But the truth is that this “law” doesn’t always apply. When your body’s under severe physical stress, it releases stress hormones. Those hormones tell your body to tap every source of energy you’ve got and dump it into your system to “escape the cheetah.” It’s not bad that this happens. That fuel is released to serve a purpose — to help your body rebuild and recover from the effects of physical stress. The only problem is that for us, that leads to high blood glucose because we don’t automatically respond to the rise in blood sugar by releasing insulin. Our doctors and CDEs just tell us to dose it down with insulin — and avoid eating until it’s normal again. But that’s not the right answer in the middle of an intense workout, or a long event, when the body’s trying to respond to very real physical stress. You need insulin AND food. 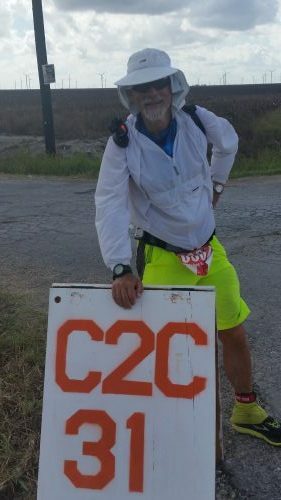 At the Honey Badger 100-miler, I was dealing with 100°+ summer temps, incredibly painful blisters, and the terror of nearly being killed by an angry driver who aimed his car at me. By Mile 83, my BG was around 550. But the race wasn’t nearly over. My wife and I talked, and we couldn’t see any way that only getting insulin would help. Even if I didn’t take another step, I had put my body through the wringer over the past 25 – 30 hours. It needed fuel no matter what. Plus, we didn’t think I needed to quit — which meant I also needed fuel to keep going. So I did both — I got some insulin, AND I ate some Blue Bell ice cream. Yes, you read that right, I ate carbs when my BG was around 500. Guess what? My sugar started coming on down, and I was able to finish. We researched stress hyperglycemia after the event. The most relevant discussion I found for Type 1 diabetics doing extreme endurance events is this chapter on Stress Hyperglycemia by diabetes specialist Dr. Anand Moses. I’m not a doctor, so I won’t even attempt to dive into the clinical details. Here was my takeaway, though: extreme physical stress in Type 1 athletes typically produces high blood sugars. While one way to bring these sugars down is to not eat for hours and hours, that’s not the right answer. The brain and the rest of the body NEED that fuel, more than ever under these circumstances. The right answer is to eat AND get insulin, so the body and brain can USE the elevated blood sugar. I used to be so afraid of injecting insulin during a workout that if I happened to be running high, I’d just keep slogging along, afraid to eat AND afraid to dose. I remember one specific day when I was training for an Ironman by doing century (100 mile) bike rides. My sugar was running well over 240 mg/dl, and I suspect I had a bad infuser on my insulin pump. Short version: I got only one runner’s gel the entire day — 30 grams total. I was wasted by the end of the day. Totally cooked. I was so hungry I wasn’t even hungry anymore. It would have been far smarter to just eat and dose. My wife always reminds me — out here in the real world, food is for energy, insulin is for blood sugar. You can be low on both. Now, that said — my experience is that I’m incredibly insulin-sensitive DURING exercise. I came across a research paper that I’m trying to find again, but some quick back-of-the-envelope math based on that study suggested that WHILE I WAS RUNNING I probably needed only 10 – 25% as much insulin as usual to adjust a high sugar without going low. That’s consistent with what I’ve experienced. If I’m running high, say around 160 – 200, I’ll often get as little as a quarter-unit of insulin, and that plus continuing to run will bring my sugar down pretty successfully. If it’s closer to 300, I might get a half-unit while continuing to run and fuel as normal. For 2 – 3 weeks after both Honey Badger and C2C, my sugars ran high. I was ravenously hungry as well. Conventional wisdom would say skip a meal, get some insulin. Especially since I wasn’t being active at the time. Gradually, I needed less sleep, less food, and the blisters healed. Then my sugars were normal again. Stress works differently. It really is a crazy mixed-up world where insulin appears to have no effect by itself and eating lowers your blood sugar. If you don’t believe me, bookmark this page, go out and try it yourself, and let me know if you still think otherwise. I mentioned earlier that like other ultra athletes, Type 1 ultra endurance athletes usually slow down on super-long endurance events. I’ve found that a slower pace reduces peak energy demand, helps me more fully metabolize fuel before I desperately need it, and reduces the short-term inflammatory response to the stress of long distance. Virtually no one, with or without diabetes, can sustain, say, a BQ marathon pace for 50 or 100 miles. And when you’re talking 100+ miles…forget about it. Ultra endurance is all about energy management. Pace yourself, and you’re less likely to get hurt, get derailed by nausea or GI issues, burned out, or have to pull out of your big event. You don’t get extra points for poor planning and pacing, and you could provoke some really seriously bad health consequences. When you do push yourself–and there’s an element of that in all ultra endurance sports–let it be with conscious forethought, for a reason, and balance it with rest and recovery time. Eat and sleep when your event will allow. Don’t pull back on fueling just to get your sugar in line–starvation plus stress doesn’t equal success. Eat real food, a little more than usual, with less fiber than usual, and remember the UltraRunner’s Manifesto: “If you have to chew it, you’ll have to poo it”). Bolus lightly as needed, and mostly at meal breaks. You can always get more insulin later if you’re wrong. Walk when your body says walk. Run when you feel up to it. Go slower in the heat, uphill, and at night if you can’t see as well. Run faster in the shade, downhill, and at dawn and dusk when the spirit grabs you and you’re simply glad to see another sunrise and be alive. Enjoy the moment, and if you can, treat it as a meditation. All those things will help reduce stress. And above all, be good to yourself. What a fascinating and in depth read! Thanks for this.